The relentless beats and bass of the Ft. Collins trio ill-Mannered is headed for the great plains. Master producer Tyler Crawford Unland and drummer Eric Imbrosciano, as well as DJ Matthew Stafford (no, not the Lions' QB who also likes to hang tough in the pocket) are taking over The Bottleneck in Lawrence, KS on Nov. 17th. Untz fans know Unland as the brains behind What! Music, who will be producing a brand new EP for the luck winner of The Untz Challenge II. 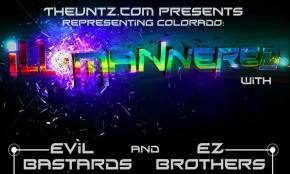 Joining ill-Mannered on the bill is the low-end duo Evil Bastards, along with KC's favorite E.Z. Brothers. Expect a bangin' night of bass-laden mania. This bill's got it all.